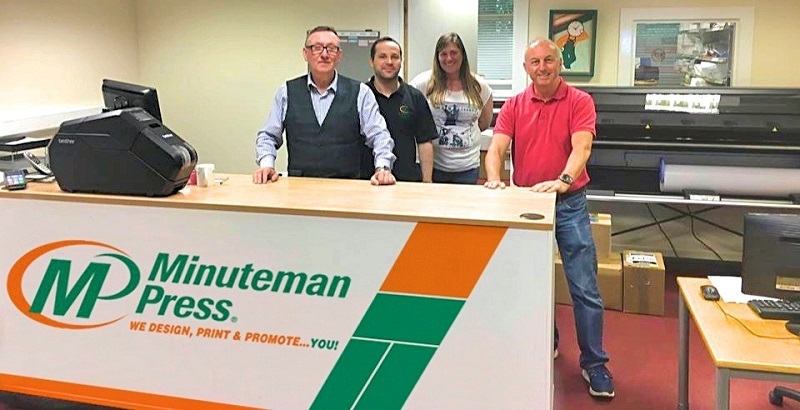 The world’s leading print, marketing and design franchise, Minuteman Press, is looking to expand its network in Scotland. Minuteman Press already has many successful franchisees in Scotland, including Falkirk, Glasgow, Ayr, Kilmarnock and Edinburgh, but there is scope to expand the brand into other key cities and towns across Scotland. A key benefit of Minuteman Press Scotland is having a dedicated local Area Manager in Glasgow who is responsible for supporting all franchisees in Scotland. The total investment for opening a Minuteman Press franchise can range from £50,000 to £60,000 when leasing the equipment. There are options available for qualified buyers that may put the initial investment in the £20,000 to £25,000 range. Richard and Jayne are prime examples of no experience in printing being required to run a Minuteman Press franchise. Richard began his career as a surveyor after leaving school and his last position was as an IT consultant while Jayne’s last role in the workforce was in the Police Force Control Room. Both earned great respect, but neither had any experience in the printing industry. This did not matter as they had gathered tremendous capabilities and leadership skills enough to contribute greatness to the Minuteman Press brand that they call their own. In 2018, Minuteman Press Helensburgh won Best Print Marketing Agency at the Scottish Enterprise Awards. Jeff and Lise bring depth of knowledge from diverse careers. Jeff graduated as a mechanical engineer (University of Bristol) and has an MBA from Kingston Business School. He was a Quality Engineer becoming a Quality Director, before moving into Programme Management as a Project Director. Lise has an artistic background, having studied Silversmithing and Jewellery to degree level, she became a Designer Jeweller until their family came along. They gained strong reputations in their industries of choice, but as their lives progressed, the demands of working for someone else became complicated and the desire to simplify and make room for more time together led them to Minuteman Press International. Gary and Janet McSkimming were intent on making family time the central focus of their lives. They did this by forming an alliance with Minuteman Press International when they signed their franchise agreement in February 2017, buying an existing printing business that needed their intention to use a proven system with tireless dedication. It seemed a victory for people who were hard workers anyway but wanted to collect a greater reward for all their efforts. Iain Gosman proves that you can buy a business, enliven it with a lifetime worth of knowledge and make people feel at ease, even as deadlines tempt a stressful mood. Iain handles things and when there’s a problem, he can aggressively find the solution when others cannot and do so in good humour, an uncommon capability that draws people to seek his help. Perhaps some credit for his tenacity should be attributed to the British Army. Fearlessness and wit are gifts he brings into his Minuteman Press franchise in Dunfermline.